The San Francisco Giants head to Comerica Park on Tuesday, July 4, 2017 to take on the Detroit Tigers. The expected starting pitchers are Matt Cain for the Giants and Michael Fulmer for the Tigers. The odds for this matchup have San Francisco at +175 and Detroit at -186. The Giants have a 38-39-7 over/under mark and a 36-48-0 run line record. The Tigers are 39-42-0 against the run line and have a 43-33-5 over/under record. The Giants have a 33-51 overall record this season. Starting pitcher Matt Cain has a 3-7 record with an earned run average of 5.46 and a WHIP of 1.71. He has 50 strikeouts over his 84 innings pitched and he's given up 109 hits. He allows 11.7 hits per 9 innings and he has a FIP of 5.22. The bullpen has an earned run average of 4.25 and they have given up 253 base hits on the year. Teams are hitting .254 against the bullpen and they've struck out 239 hitters and walked 112 batters. As a team, San Francisco allows 9.7 hits per nine innings while striking out 7.8 batters per nine innings. They are 22nd in the league in team earned run average at 4.61. The Giants pitchers collectively have given up 815 base hits and 389 earned runs. They have allowed 93 home runs this season, ranking them 26th in the league. San Francisco as a pitching staff has walked 254 batters and struck out 655. They have walked 3 men per 9 innings while striking out 7.8 per 9. They have a team WHIP of 1.41 and their FIP as a unit is 4.11. As a team San Francisco is hitting .244, good for 22nd in the league. The Giants hold a .374 team slugging percentage and an on-base percentage of .305, which is good for 28th in baseball. They rank 22nd in MLB with 8.4 hits per game. Buster Posey is hitting .339 with an on-base percentage of .416. He has 87 hits this season in 257 at bats with 35 runs batted in. He has a slugging percentage of .521 and an OPS+ of 150. Eduardo Nunez is hitting .299 this year and he has an on-base percentage of .323. He has totaled 76 hits and he has driven in 25 men in 254 at bats. His OPS+ is 96 while his slugging percentage is at .413. The Giants have 709 hits, including 137 doubles and 70 home runs. San Francisco has walked 244 times so far this season and they have struck out 621 times as a unit. They have left 577 men on base and have a team OPS of .679. They score 3.94 runs per contest and have scored a total of 331 runs this year. Detroit has a 36-45 overall mark this year. With an earned run average of 3.19, Michael Fulmer has a 7-6 record and a 1.13 WHIP. He has 78 strikeouts over the 101.2 innings he's pitched. He's also given up 91 hits. He allows 8.1 hits per nine innings and his FIP stands at 2.95. The bullpen has an earned run average of 5.23 and they have given up 249 base hits on the year. Teams are hitting .257 against the Tigers bullpen. Their relievers have struck out 226 batters and walked 109 opposing hitters. As a team, Detroit allows 9.5 hits per nine innings while striking out 7.7 batters per nine innings. They are 28th in the league in team earned run average at 4.89. The Tigers pitchers as a team have surrendered 748 base knocks and 386 earned runs this season. They have given up 104 home runs this year, which ranks 12th in Major League Baseball. Detroit as a staff has walked 276 hitters and struck out 611 batters. They give up a walk 3.5 times per 9 innings while they strike out 7.7 per 9. Their team WHIP is 1.44 while their FIP as a staff is 4.60. As a team, they are batting .254, good for 15th in the league. The Tigers hold a .430 team slugging percentage and an on-base percentage of .328, which is good for 10th in baseball. They rank 15th in MLB with 8.7 hits per contest. 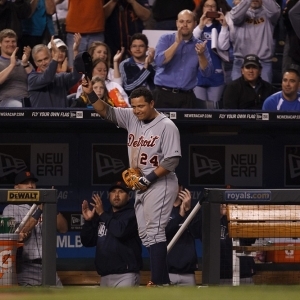 Miguel Cabrera comes into this matchup batting .262 with an OBP of .357. He has 66 hits this year along with 39 RBI in 252 AB's. He maintains a slugging percentage of .452 with an OPS+ of 116. Justin Upton is hitting .267 this season and he has an OBP of .351. He has collected 72 hits in 270 at bats while driving in 52 runs. He has an OPS+ of 125 and a slugging percentage of .500. The Tigers as a unit have 701 base hits, including 147 doubles and 102 homers. Detroit has walked 284 times this year and they have struck out on 681 occasions. They have had 555 men left on base and have an OPS of .759. They have scored 4.78 runs per game and totaled 387 runs this season. Who will win tonight's Giants/Tigers MLB game against the spread?